Okay, I guess it's redundant at this point, but I like to be complete in these "Upcoming Ditko" posts. 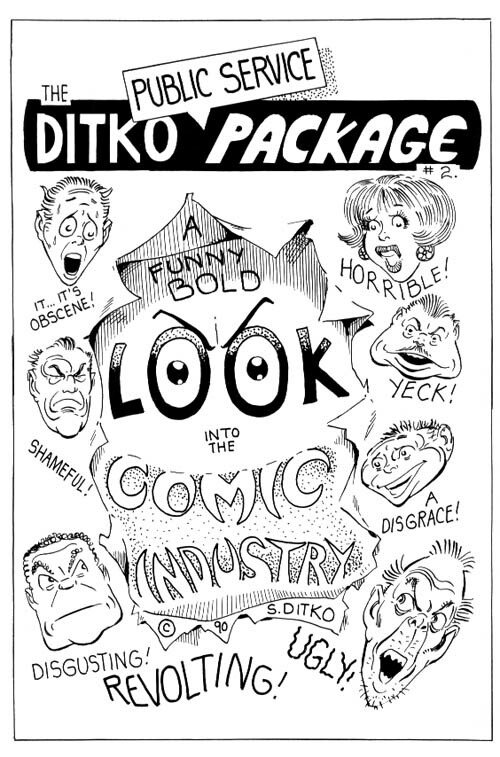 Kickstarter site for the 2nd Edition of THE DITKO PUBLIC SERVICE PACKAGE over here. Looking to make its funding goal in a few more days, but spread around the link so people know about it. For people who don't do Kickstarter, whenever I have details on alternative buying options they'll be over here. It's a very strange book, by the way. In all the best ways. I'll have more about it over the next month. If you have the first edition, feel free to talk about it in the comments. I backed this as soon as you mentioned in the other day. I wish it were June so I could read it. I have a copy of the first edition, published in February 1991. I bought it online some years ago, but I've also backed the Kickstarter. It's great to be able to support the project, and to get mentioned in the contributor's page. 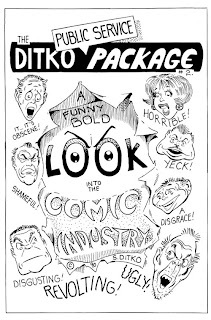 The original comic is a full 110 page story, featuring Ditko's polemic on the comic industry's business malpractices and lunacy. The character's aren't based on actual people, but there's an assortment of comic book personalities like publishers, the media, accountants, collectors, fanboys and even a mad scientist! Ditko also does a lot of nice visual gags with animated comic pages and talking art supplies. There's some imaginative, humorous cartooning going on here, with lots of classic Ditko designing and inking. I'm glad this book is going back to print, and like many, I was very surprised to see it appear as a Kickstarter campaign. The Snyder/Ditko publishing brand continues to surprise us, and provide us with some great Ditko comics.